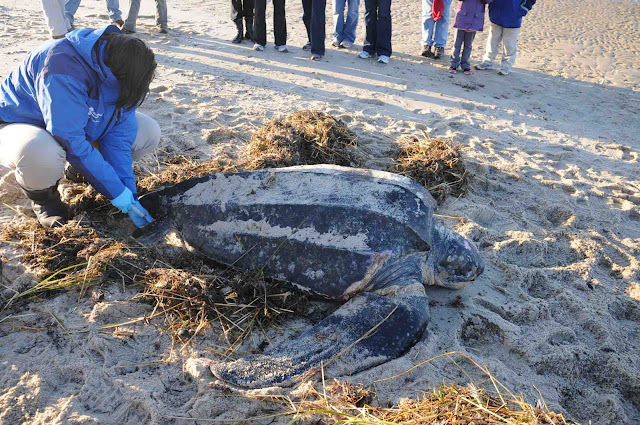 On Saturday afternoon our Rescue team responded to a stranded leatherback sea turtle. With help from our partners at the Wellfleet Audubon and IFAW's marine animal rescue team, we responded to a giant leatherback in distress on a beach at Crow's Pasture in Dennis, MA. In the photo above Dr. Cavin collects a blood sample. While most of our blog followers know we are preparing for cold stun season, this 400 pound juvenile sea turtle is definitely not one of the usual sea turtles that cold-stun. Leatherbacks can actually regulate their body temperature to some degree and generally do not strand as a result of hypothermia. Leatherbacks are open ocean dwellers that very rarely strand on beaches. In the photo above Dr. Innis performs an oral exam. Oral exams are standard triage protocol. We typically find sand and salt in or around their mouth and nares. Prior to and during the oral exam this animal had a red tinged fluid coming from the nares. In the photo above Dr. Innis, Dr. Cavin and Connie check the core body temperature while one of our volunteers times respiration rates on her smartphone. Core body temperature, respiration rates/character, heart rate, body condition and wound assessment all provided crucial information regarding the health of the animal. 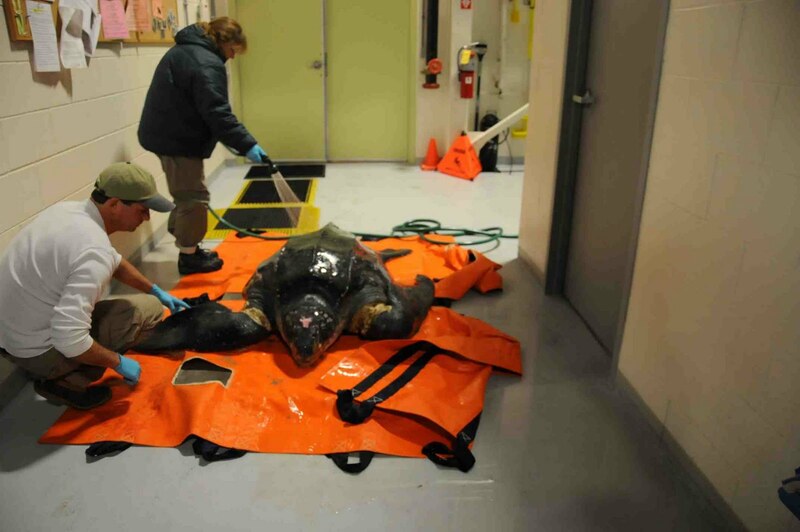 This turtle was in poor condition with a reduced core body temperature, thin body condition and serious tissue trauma. If you look closely at her front flippers you can see the severe life-threatening entanglement injuries. After completing the initial beach assessment, including evaluating the initial blood values, we decided this turtle was not a candidate for immediate release and needed emergency care. With help from Audubon, the Dennis Department of Natural Resources, IFAW and the animal control officer of Dennis, we loaded the animal into our rescue vehicle for the trip to our sea turtle hospital. 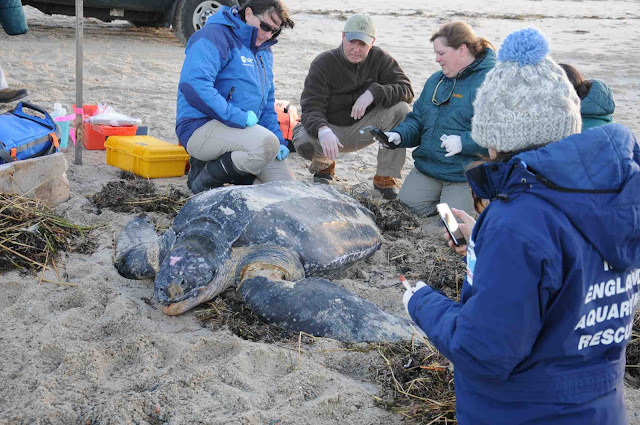 In the photo above Connie rinses the sand from the wounds and the turtle while Dr. Innis gets a first look at the injuries without sand and seaweed embedded in them. 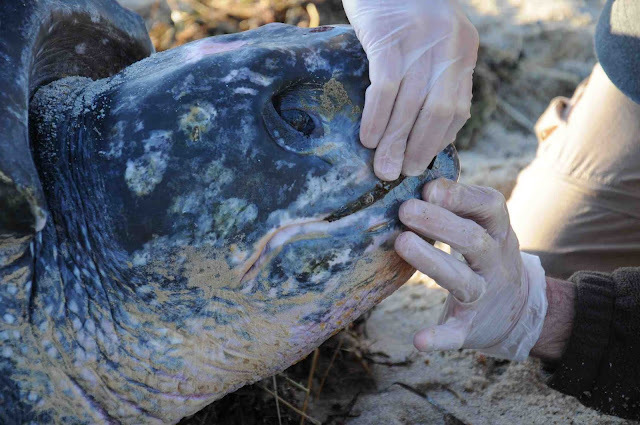 The wounds of this animal were embedded with sand and salt, which, if not removed, will continue to rub against the turtle causing tissue breakdown and continue to irritate the skin. 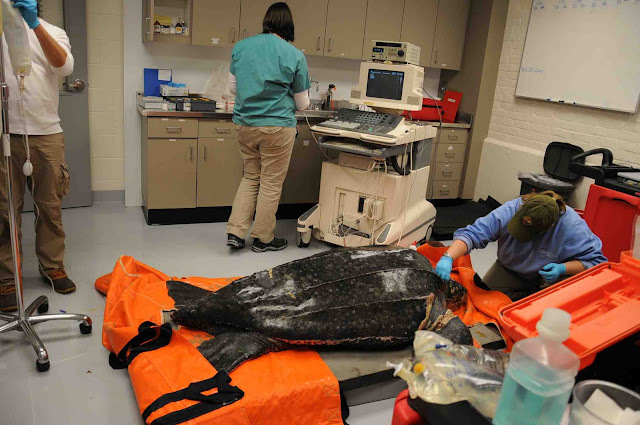 In the photo above the turtle received treatment in the sea turtle hospital clinic. Once in the clinic we administered emergency medication to stabilize the animal, continued to monitor vital signs and provided supportive care. On the left side of the photo above Dr. Innis can be seen getting fluids ready to give to our patient. 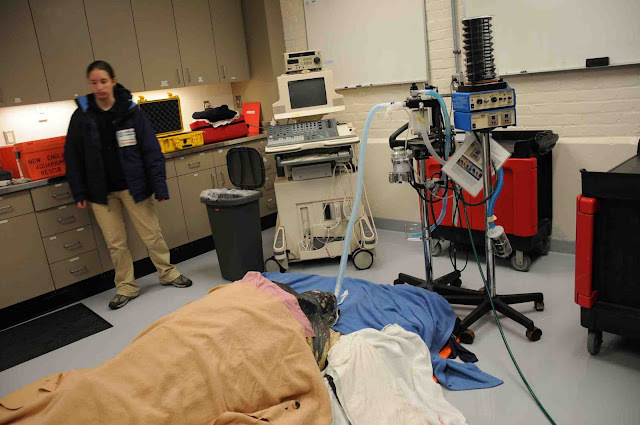 Dr Cavin (center) is setting up the ultrasound machine and Connie is stimulating the turtle to make sure she is still responsive. During the night the turtle had periods of unresponsiveness and her blood values began to decline. Dr. Innis and Kerry (pictured above) stayed with the turtle overnight and continued life saving medicine. 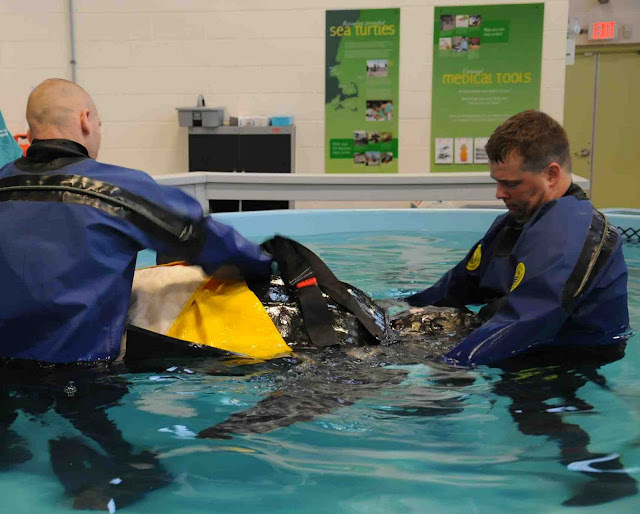 Early in the morning they had to intubate the turtle as she had stopped breathing on her own. We attempted water therapy as a form of stimulation in hopes of reviving her however the animal never responded. In the photo below Adam and Kurt stimulate the animal in water. Unfortunately, this story has a sad ending as our patient succumbed from the complications of the severe entanglement. Oh how I love the leatherbacks and their "gigantothermy"
Thanks for your efforts guys can't save them all though you do try. I saw her on the beach. Keep your heads up.